Pictured are jurors who made up the first Monroe and Randolph County Teen Court. The students came from high schools in both counties. Also pictured are teen court administrator Jana Bollman Young (back row, at left), retired judge Annette Eckert (front row, at left) and Regional Superintendent of Schools Kelton Davis (back row, at right). 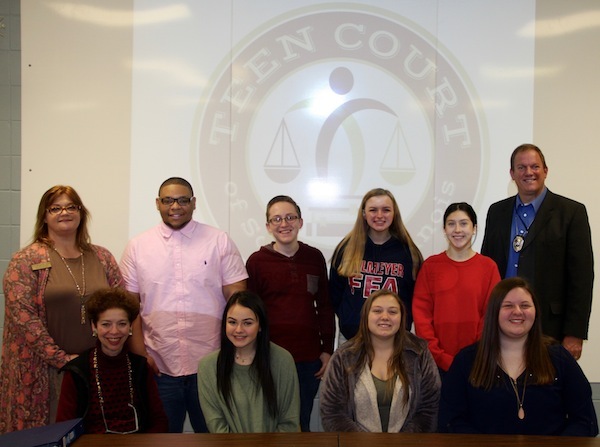 The teen court for Monroe and Randolph counties held its first session Jan. 26, with two teens being prescribed remedies for crimes they committed. Teen court, which has been in the works for about a year, offers high school-aged teens who break the law a different way to pay for their transgressions through restorative justice. The program is targeted at first-time, non-violent youth offenders. The state’s attorneys from both counties recommend offenders for the court, but only those who have admitted to their crimes. Made up of seven jurors from both counties, the court heard two cases Saturday. Both teen offenders were from Randolph County. They were charged with criminal trespass to a residence. The offense can carry a maximum of one year in jail. The cases were heard separately. Teen court is confidential, so all names and specific case information have been omitted. In the case of the first teenager, jurors learned that this marked the youth’s second offense, as the teen was previously on court supervision for burglary. Additionally, the teen admitted to using marijuana. They also learned the youth’s father had a heroin addiction for years, as did the offender’s stepmother. The biological mother is not part of the teen’s life. In recent weeks, the teenager has been attempting to improve. The youth now has a job and is raising his or her grades. “I’m trying to turn my life around,” the adolescent said. After conferring, the jurors devised five remedies for the offender. The teenager must write an apology letter to his or her young siblings and the victim, complete a project designed to help the teen focus on his or her goals and achieving them, interview a welder and go to a welding class because that is what the teen wants to do, read a book called “Suburban Junkie” and report on it to the court, attend a Narcotics Anonymous or Alcoholics Anonymous meeting, and discuss the project, book and meeting with his or her father. In the case of the second offender, the jury learned that teen has a history of running from the police, a history of anger issues and comes from an abusive family. The teen’s father left a few years ago, and that is when he or she started having behavioral issues. “My dad hates me,” the adolescent said, unable to meet the jurors’ eyes. Faced with that case, the jurors decided on the following remedies. The teen must participate in a ride along with the Randolph County Sheriff’s Department, perform at least 16 hours of community service with an adult who has shown interest in the teen, attend at least two church services or youth activities at that adult’s church, follow up with a counselor on seeking counseling and write a letter of apology to the victim. After informing both teens of the remedies, Eckert told them the same thing. “I know I speak for everyone here, but especially your peers, when I say we hope that we have you back here for graduation,” she said. The teen offenders have 90 days to complete their remedies. If they do not, their cases are expedited through the criminal justice system. The adult leaders who have been instrumental in making teen court a reality offered praise for the jurors. Regional Superintendent of Schools Kelton Davis said the teens blew him away. The jurors also thought the first court went well. “I think it’s a great thing to give teens our age a second chance,” a juror from Randolph County added.